Parliament was treated last night to a magnificent concert by Côr Meibion Llanelli, conducted by their very talented musical director Eifion Thomas. This was a very special concert to celebrate the Choir’s 50th anniversary, and their varied programme included the American Trilogy as well as traditional Welsh favourites like Nant y Mynydd, Tangnefeddwyr and Myfanwy. The soloist was Osian Bowen, a pupil at Ysgol y Strade, who stunned the audience, even though he had to contend with the division bell calling MPs to vote going off when he was mid-song. 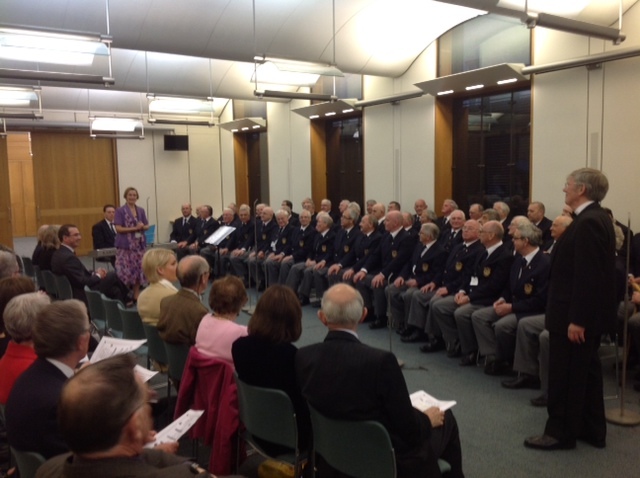 The spell – bound audience included Dr Haydn James and members of the London Welsh Choir, London Gwalia Choir and the London Glamorgan Society, as well as members of parliament and members of the House of Lords.